Mikhail AE, Palomo A, Reoyo JF y Seco Gil JL. Fijación del material protésico en la hernioplastia inguinal abierta: sutura vs. cola sintética. Cir Esp. 2012; 90:446-52. Smietański M, Bury K, Smietańska IA, Owczuk R, Paradowski T. Five-year results of a randomised controlled multi-centre study comparing heavy-weight knitted versus low-weight, non-woven polypropylene implants in Lichtenstein hernioplasty. Hernia 2011 Oct;15(5):495-501. Ban LJ, Lei WZ, Liu Y, Gong YP, Zeng Y, Yang L, Zhang W. Comparison of three concentrations of simplex lidocaine in local anesthesia for inguinal hernia mesh-repairs. Hernia 2011 Oct;15(5):517-20. Tollens T, Den Hondt M, Devroe K, Terry C, Speybroeck S, Aelvoet C et al. Retrospective analysis of umbilical, epigastric, and small incisional hernia repair using the Ventralex™ hernia patch. Hernia 2011 Oct;15(5):531-40. Sadowski B, Rodriguez J, Symmonds R, Roberts J, Song J, Rajab MH et al. Comparison of polypropylene versus polyester mesh in the Lichtenstein hernia repair with respect to chronic pain and discomfort. Hernia 2011 Dec;15(6):643-54. Sabbagh C, Dumont F, Fuks D, Yzet T, Verhaeghe P, Regimbeau JM. Progressive preoperative pneumoperitoneum preparation (the Goni Moreno protocol) prior to large incisional hernia surgery: volumetric, respiratory and clinical impacts. A prospective study. Hernia 2012 Feb;16(1):33-40. Kim-Fuchs C, Angst E, Vorburger S, Helbling C, Candinas D, Schlumpf R.
Prospective randomized trial comparing sutured with sutureless mesh fixation for Lichtenstein hernia repair: long-term results. Hernia 2012 Feb;16(1):21-7. Rehman S, Khan S, Pervaiz A, Perry EP. Recurrence of inguinal herniae following removal of infected prosthetic meshes: a review of the literatura. 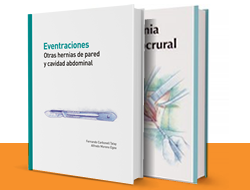 Hernia 2012 Ap;16:123–126. Lionetti R, Neola B, Dilillo S, Bruzzese D, Ferulano GP. Sutureless hernioplasty with light-weight mesh and fibrin glue versus Lichtenstein procedure: a comparison of outcomes focusing on chronic postoperative pain. Hernia 2012 Ap;16:127–131. Ergul Z, Akinci M, Ugurlu C, Kulacoglu H, Yilmaz KB. Prophylactic antibiotic use in elective inguinal hernioplasty in a trauma center. Hernia 2012 Ap;16:145–151. Kukleta KF, Freytag C, Weber M. Efficiency and safety of mesh fixation in laparoscopic inguinal hernia repair using n-butyl cyanoacrylate: long-term biocompatibility in over 1,300 mesh fixations. 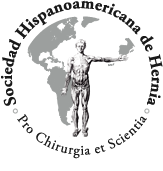 Hernia 2012 Ap;16:153–162. Muysoms F, Campanelli G, Champault GG, DeBeaux AC, Dietz UA, Jeekel J et al. EuraHS: the development of an international online platform for registration and outcome measurement of ventral abdominal wall hernia repair. Hernia 2012 Jun;16:239–250. Stechemesser B, Jacob DA, Schug-Paß C, Köckerling F. Herniamed: an Internet-based registry for outcome research in hernia surgery. Hernia 2012 Jun;16:269–276. of a prospective randomized controlled trial. Hernia 2012 Jun;16:277–285. Kingsnorth A, Gingell-Littlejohn M, Nienhuijs S, Schu ̈le S, Appel P, Ziprin P et al. versus lightweight polypropylene mesh in open inguinal hernia repair: interim results at 3 months. 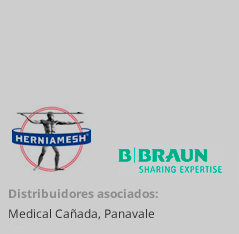 Hernia 2012 Jun;16:287–294. Nasir BS, Zendejas B, Ali SM, Groenewald CA, Heller SF, Farley DR. Obturator hernia: the Mayo Clinic experience. Hernia 2012 Jun;16:315–319. E. Erdas C, Dazzi F, Secchi S, Aresu A, Pitzalis M, Barbarossa A, Garau A, Murgia P. Incidence and risk factors for trocar site hernia following laparoscopic cholecystectomy: A long-term follow-up study. Hernia (2012) 16:431–437. N. A. Henriksen, J. Thorup L. N, Jorgensen. Unsuspected femoral hernia in patients with a preoperative diagnosis of recurrent inguinal hernia. Hernia (2012) 16:381–385. U. A. Dietz C, Wichelmann C, Wunder J, Kauczok L, Spor A, Strau R, Wildenauer C, Jurowich C. Early repair of open abdomen with a tailored two-componentmesh and conditioning vacuum packing: a safe alternative to the planned giant ventral hernia. Hernia (2012) 16:451–460. N. Schouten J. P. J, Burgmans T, Van Dalen N, Smakman G. J, Clevers P. H. P, Davids E. J. M. M, Verleisdonk S. G, Elias R. K. J, Simmermacher. Female ‘groin’ hernia: totally extraperitoneal (TEP) endoscopic repair seems the most appropriate treatment modality. Hernia (2012) 16:387–392. B. Romain, R Chemaly, N Meyer, C Brigand, J. P Steinmetz. Prognostic factors of postoperative morbidity and mortality in strangulated groin hernia. Hernia (2012) 16:405–410. Y. Soon, E. Yip, S. Onida, H. Mangat. Single-port hernia repair: a prospective cohort of 102 patients. Hernia (2012) 16:393–396. Does nerve identification during open inguinal herniorrhaphy reduce the risk of nerve damage and persistent pain? Eriksen JR, Bisgaard T, Assaadzadeh S, Nannestad Jorgensen L and Rosenberg J.
Randomized clinical trial of fibrin sealant versus titanium tacks for mesh fixation in laparoscopic umbilical hernia repair. British Journal of Surgery 2011; 98: 1537–1545. Sajid MS, Leaver C, Baig MK and Sains P. Systematic review and meta-analysis of the use of lightweight versus heavyweight mesh in open inguinal hernia repair. British Journal of Surgery 2012; 99: 29–37. Joshi GP, Rawal N and Kehlet H. Evidence-based management of postoperative pain in adults undergoing open inguinal hernia surgery. British Journal of Surgery 2012; 99: 168–185. Swank HA, Mulder IM, la Chapelle CF, Reitsma JB, Lange JF and Bemelman WA. Systematic review of trocar-site hernia. British Journal of Surgery 2012; 99: 315–323. Pierides G, Scheinin T, Remes V, Hermunen K and Vironen J. Randomized comparison of self-fixating and sutured mesh in open inguinal hernia repair. British Journal of Surgery 2012; 99: 630–636. Walter CJ, Dumville, JC, Sharp CA and Page T. Systematic review and meta-analysis of wound dressings in the prevention of surgical-site infections in surgical wounds healing by primary intention. British Journal of Surgery 2012; 99: 1185–1194. Thomassen I, van Suijlekom HA, van der Gaag A and Nienhuijs SW. Intervention techniques for chronic postherniorrhaphy pain. Eur Surg 2012;44/3: 132–137. H. Kang. The effect of dexmedetomidine added to preemptive ropivacaine infiltration on post-operative pain after inguinal herniorrhaphy: a prospective, randomized, double-blind, placebo-controlled study. Eur Surg (2012) 44/4: 274–280. Johner A, Faulds J and Wiseman SM. Planned ilioinguinal nerve excision for prevention of chronic pain after inguinal hernia repair: A meta-analysis. Surgery 2011;150:534-41. Eker HH, van Ramshorst GH, de Goede B, Tilanus HW, Metselaar HJ, de Man RA et al. A prospective study on elective umbilical hernia repair in patients with liver cirrhosis and ascites. Surgery 2011; 150:542-6. Shen Y, Sun W, Chen J, Liu S and Wang M. NBCA medical adhesive (n-butyl-2-cyanoacrylate) versus suture for patch fixation in Lichtenstein inguinal herniorrhaphy: A randomized controlled trial. Surgery 2011; 151:550-5. Gruppo M, Mazzalai F, Lorenzetti R, Piatto G, Toniato A and Ballotta E. Midline abdominal wall incisional hernia after aortic reconstructive surgery: A prospective study. Surgery 2011; 151:882-8. Itani K, Rosen M, Vargo D, Awad S, DeNoto G , Butler C. Prospective study of single-stage repair of contaminated hernias using a biologic porcine tissue matrix: The RICH Study. Surgery 2012; 152:498-505. Goussous N, Kim B, Jenkins D and Zielinski M. Factors affecting primary fascial closure of the open abdomen in the nontrauma patient. Surgery 2012; 152:777-84. Maso RJ, Moazzez A, Sohn HJ, Berne TV and Katkhouda N. Laparoscopic Versus Open Anterior Abdominal Wall Hernia Repair. 30-Day Morbidity and Mortality using the ACS-NSQIP Database. Ann Surg 2011;254:641–652. Campanelli G, Hidalgo Pascual M, Hoeferlin A, Rosenberg J, Champaul G, Kingsnorth, A and Miserez M. Randomized, Controlled, Blinded Trial of Tisseel/Tissucol for Mesh Fixation in Patients Undergoing Lichtenstein Technique for Primary Inguinal Hernia Repair. Results of the TIMELI Trial. Ann Surg 2012;255:650–657. ten Broek RPG, Schreinemacher MHF, Jilesen APJ, Bouvy N, Bleichrodt RP and van Goor H. Enterotomy Risk in Abdominal Wall Repair: A Prospective Study. Annals of Surgery. 256(2):280-287, August 2012. Moreno-Egea A, Carrillo-Alcaraz A, Aguayo-Albasini JL. Is the outcome of laparoscopic incisional hernia repair affected by defect size? A prospective study. The American Journal of Surgery (2012) 203, 87–94. Beale E, Hoxworth R, Livingston E and Trussler A. The role of biologic mesh in abdominal wall reconstruction: a systematic review of the current literatura. The American Journal of Surgery (2012) 204, 510–517. Tekatli H, Schouten N, van Dalen T, Burgmans I, Smakman N. Mechanism, assessment, and incidence of male infertility after inguinal hernia surgery: a review of the preclinical and clinical literatura. The American Journal of Surgery (2012) 204, 503–509. Seth AK, Matthew R. Geringer,Robert D. Galiano, Kai P. Leung, Thomas A. Mustoe,Seok J. Hong. Quantitative Comparison and Analysis of Species-Specific Wound Biofilm Virulence Using an In Vivo, Rabbit-Ear Model. Journal of the American College of Surgeons.Volume 215, Issue 3, Pages 388-399. Marchesi F, Pinna F, Cecchini S, Sarli L and Roncoroni L. Prospective Comparison of Laparoscopic Incisional Ventral Hernia Repair and Chevrel Technique. Surg Laparosc Endosc Percutan Tech 2011;21:306–310. Grønvold LB, Spasojevic M, Nesgaard JM, Ignjatovic D. Single-incision Laparoscopic Versus Conventional Laparoscopic Ventral Hernia Repair: A Comparison of Short-term Surgical Results. Surgical Laparoscopy, Endoscopy & Percutaneous Techniques. 22(4):354-357, August 2012. Abbas A, Abd Ellatif M, Noaman N, Negm A, El-Morsy G, Amin M and Moatamed A. Patient-perspective quality of life after laparoscopic and open hernia repair: a controlled randomized trial. Surg Endosc (2012) 26:2465–2470. Reynvoet E, Berrevoet F, De Somer F, Vercauteren G, Vanoverbeke I, Chiers K and Troisi R. Tensile strength testing for resorbable mesh ﬁxation systems in laparoscopic ventral hernia repair. Surg Endosc (2012) 26:2513–2520. Hicks CW, Krpata DM, Blatnik JA, Novitsky YW, Rosen MJ. Long-Term Effect on Donor Sites after Components Separation: A Radiographic Analysis. Plastic & Reconstructive Surgery. 130(2):354-359, August 2012. Kotidis E, Papavramidis T, Ioannidis K, Koliakos G, Lazou T, Cheva A et al. Can Chronic Intra-Abdominal Hypertension Cause Oxidative Stress to the Abdominal Wall Muscles? An Experimental Study. Journal of Surgical Research. Volume 176, Issue 1, July 2012, Pages 102–107. Liang MK, Clapp ML, Garcia A, Subramanian A and Awad SS. Mesh shift following laparoscopic ventral hernia repair. Journal of Surgical Research Volume 177, Issue 1, September 2012, Pages e7–e13.